This book has a particular resonance for many graduates of Smarter Egg programmes. The award-winning documentary photographer, Roger Overall, shares his unique reflections on how the book has inspired him. 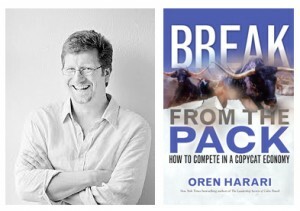 For me, it was and always has been, the first book Aodan introduced me to: Break From The Pack – How To Compete In A Copycat Economy by Oren Harari. Ironically, the book is possibly more relevant to me now than it was two years ago when I first sat down to read it. The book appealed to me at the time because of where I was mentally and commercially. I was breaking, or had just broken, from the pack. In my case, the pack was photographers, specifically wedding photographers. I’d taken a decision to provide a very documentary approach to my wedding coverage – a wedding photojournalist, if you will. Now, this approach wasn’t unique to me and I most certainly wasn’t the first ever photographer to shoot weddings in this style. What set me aside, or ahead, in Ireland was the vigour and passion with which I’d latched on to genuine documentary photography as the ideal storytelling device for weddings. The reason for my zeal was tragedy – the death of my sister from cancer at a young age four years ago. I took the last photograph of her, her husband and her daughter together. It captures a moment of happiness. A day or so later, she was dead. That photograph has been the bedrock of my career since. A true, unposed moment that shows the love of a family under difficult circumstances. No posed photograph could ever compete with that. I became very vocal on the issue of pure moments on wedding days rather than faked ones. It earned me a reputation. Awards followed, which enhanced that reputation. Soon, I was in a relentless and stimulating groove. I even developed a new concept for a wedding album: a book that combined photographs with a couple’s own recollection of their wedding day, written by me based on a formal interview with them. The latter drew on my experience as a journalist in a previous life. I called it my “Legacy” product. So there I was reading a book that made total sense to me because I could understand exactly what the author, Oren Harari was saying. He was writing about my own experience – putting into words what I had only sensed but couldn’t articulate. That was a very powerful experience. Then, gradually, it all started to go wrong. People started copying me. Copying my techniques, copying my compositions, even copying the way I phrased things. The pack was catching up. Worse, “Legacy” proved a failure. It drew interest, but never flew – either it was too far ahead of its time, or it was misconceived to begin with. Then the wedding industry started to shift seismically. For reasons too boring to go into here (I have my own blog for that sort of thing), the niche I’d carved out for myself in the wedding market could no longer sustain me. In fact, such has been the change that I’ve taken the decision to leave the wedding market. That is chapter 5 in the book: ‘Dominate or Leave’. Leaving was a very hard decision. I’m a storyteller at heart, so not being able to tell the stories I wanted to through photographs was a bit of a wrench. I’m seeking other outlets, but it is slow going. In many ways, I’m back at “GO”. I’m refocusing my business, plotting my next breakaway. This time, though, rather than instinctively knowing what to do and acting with rapier precision and direction, I’m feeling my way. This time around, Oren’s book isn’t telling me what I’ve just done, it’s guiding me to what I need to do. This entry was posted in Book That Inspired Me on October 28, 2011 by Aodan Enright. Thanks for sharing that personal story Roger. Your optimism through tragedy and business challenges is inspiring. This book has become synonymous with Smarter Egg’s early years and has inspired so many to view their work in a more realistic light. The ‘Dominate or Leave’ chapter to which you refer has helped many of us to be more focused in what we do. So many other great lessons in this book. Would recommend it to anyone. Wow. Really liked that blog. Got me thinking about ways I can be remarkable in my niche. Thanks. Both Aodan Enright & Roger Overall are friends of mine. Everything I say here is coloured by that. They are both extraordinary individuals – sincere, authentic & real. Even though Roger has told me the story about how his sister’s death influenced him to major on a documentary approach, it never sunk in fully. I heard the words but I didn’t make the connections. Reading this blogpost has joined up many different strands. That’s what Roger & Aodan do. They help others to link & make meaning. They use their personal experience in a style that cuts through – maybe because they integrate narrative & emotion so well, so distinctively well. I remember the day Aodan Enright invited me to join SmarterEgg. I had no idea what I was accepting. But when I found myself in a room with Oran Horari (the book) & a group of people I’d never met, ir felt right. “Breaking from the Pack” influenced me – it worked with 3 other books to give me courage & encouragement. To be strong, clear & different – to be a unique snowflake. Oran’s writing – which combines journalistic storytelling with analytic data-mining suited me perfectly. The book has never been far from my hand or mind. I wonder what would have happened if I’d found Oran Horari while browsing in Waterstones (or O’Mahony’s Bookshop in Limerick Ireland)? Alone without the support of SmarterEgg, would “Breaking from the Pack” have flopped? I doubt it but I also doubt it would have had half the impact. The discipline of reading Oran in company with fellow-travellers affected me, helped me consume the book. By consuming I mean “reading deeply” – letting the content have its way with you. Letting the challenge to communicate with others weave magic. Hyperbolic? I suppose that’s my style, one of my differentiators :). Oran is like that – he strengthens your gut instinct that you better be distinct in this all consuming world. Oran’s message to me was be yourself – know yourself – develop yourself. It was the chef if Il Bulli (restaurant RIP) who defined innovation in the fewest possible words: never copy. It was Oran & SmarterEgg that made me rock solid on this. What more developmental message could you receive than this – be you – love the person you are – honour your genius by putting it at the heart of all you do & stand for. From the vantage point of valuing your “USP” – reach out to others so that they may find themselves similarly encouraged. Paul, thanks for sharing your story on how these ideas have impacted you. What fascinates me here is how your interpretation of the ideas continues to evolve over time and through conversations. And many thanks for those kind words.